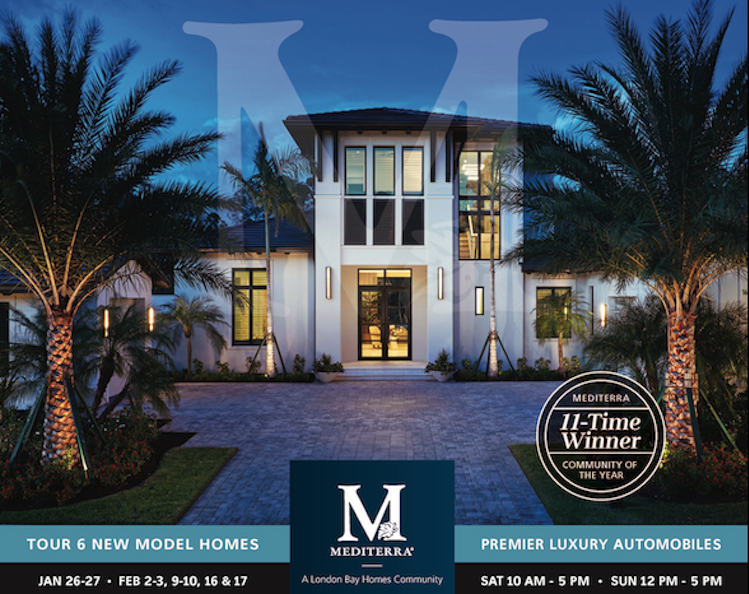 Prospective homeowners seeking to envelop themselves in the luxury living lifestyle at Mediterra Naples will get their opportunity during London Bay Homes’ 2019 Winter Model Home Showcase. Beginning the weekend of Saturday, January 26th and occurring over four consecutive weekends until Sunday, February 17th, Mediterra Naples will be open to the public to show off six luxury model homes built by Naples custom homebuilder, London Bay Homes, paired with stunning luxury automobiles from Naples Motorsports. Starting at 10am on Saturdays and 12pm on Sundays and ending at 5pm on both days, guests will be able to glide through the Mediterra gates to visit each luxury model home and see the quality architecture and superior interior design from London Bay Homes and the award-winning team at Romanza Interior Design. Delve into the details of each one to begin your journey through Mediterra with your favorite luxury model home and remember to speak to one of our friendly and knowledgeable Sales executives to get more details on the luxury amenities and carefree lifestyle you will have when you live in Naples’ most sought-after community. The Clara is one of three available floor plans in Cabreo at Mediterra. It is also the largest with three bedrooms and three and one-half baths in its 3,248 square feet under air. Fully furnished by Romanza Interior Design, the Clara features a modern, clean approach to the traditional with a Modern Classic design, dark wood accents, and soft blue and green accents, fabrics, and accessories flowing throughout the main living area. The family room, living room, and master suite open up to the outdoor living area with a sparkling pool and spa. The outdoor living space is complete with a picturesque lake view. With the outdoor living area, covered entry, and three-car garage, the Clara offers 4,740 total square feet. View the Clara model home. The Capriano is a luxury, two-story villa model featuring four bedrooms and four bathrooms in its 4,402 square feet of living space. It is located in Lucarno, a 71-home maintenance-free villa neighborhood in Mediterra that is reminiscent of an intimate European village with cobblestone streets, lakes, and gardens. The home features a soft contemporary look created by Romanza Interior Design’s Jennifer Stevens, who used furniture forms, lighting fixtures, wood and metal tones, and bright accents of green, orange, melon, and yellow to create a tranquil environment in the home’s open spaces. Gold lighting fixtures, a patterned area rug, and bright orange, melon, and green cushions add to the appeal of the unique contemporary design in the home’s main living space. View the Capriano model home in Lucarno. The Falerno is a fully-furnished Florida-style home with three bedrooms, four bathrooms, and a spacious great room and dining area, as well as a nearby private study. It offers 3,257 square feet under air with a transitional interior design created by Romanza Interior Design that features neutral vanilla-toned backgrounds with amber, slate, and gray-toned accents. This subtle design base is accented by extensive contemporary millwork details, rich metal and wood elements, and textures that bring signature pieces to life. The design continues in the covered outdoor living area, which is equipped with an outdoor kitchen, and overlooks the semicircular pool and spa with adjoining fire feature. The lakefront views offer a tranquil setting, while a short walk to Mediterra’s gardens provides a wonderful way to spend your afternoon gazing at the lush landscape of this beautiful community. View the Falerno estate home. One of London Bay Homes’ most popular floor plans, the Isabella II, has been a prime choice for many London Bay Homes clients due to its comfortable design and expansive outdoor living space. This version of the floor plan takes it to another level with a second story that adds even more space and luxury than ever before. 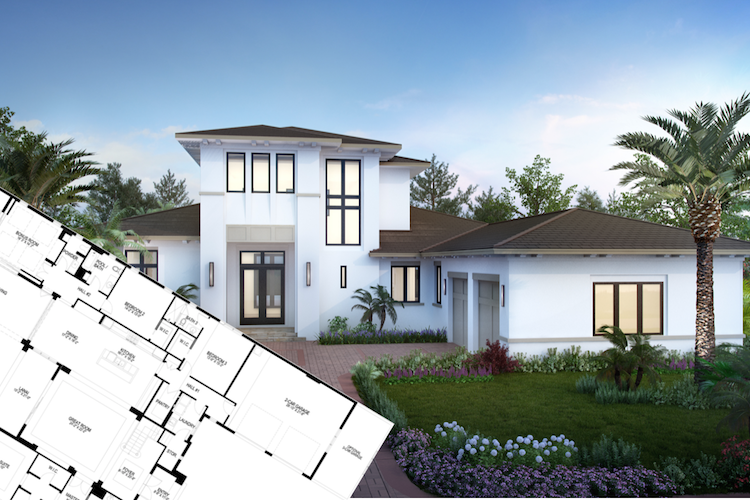 With the new second story, this Isabella Two-Story is equipped with a fourth bedroom and a serene sitting area with a covered balcony for those relaxing nights where a glass of wine and a good book is all you need to unwind after a long day of invigorating activities at Mediterra. The additions will allow for 4,265 square feet under air and a total of 6,353 square feet once the Florida-friendly outdoor living space and three-car garage are added. View the Isabella Two-Story home. The Catalina is is one of the very few remaining luxury model homes available in the Cortile neighborhood at the heart of Mediterra Naples. It features 5,288 square feet under air with an inviting open floor plan blending the great room, kitchen, and café. 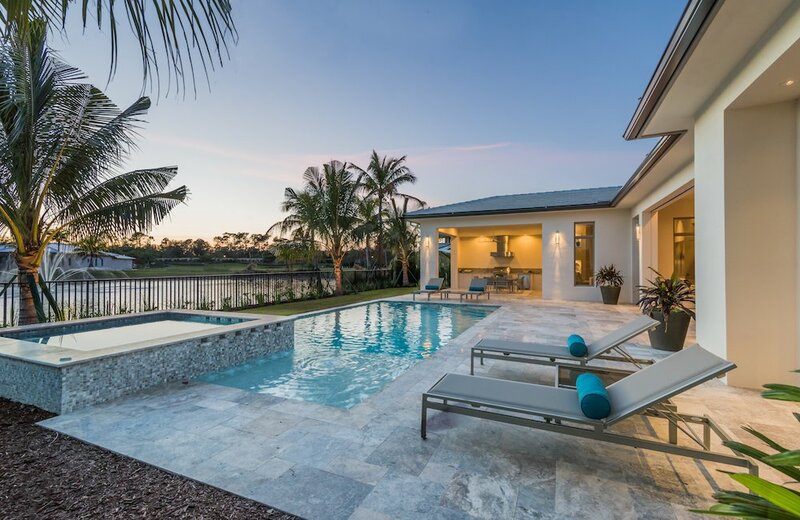 From the café, large bonus room, and master bedroom, homeowners and guests can access the 950 square foot outdoor living area with resort-inspired linear pool with a sun shelf, a raised spa, a fountain near a raised fire pit, a summer kitchen, and living and dining room areas. The second floor includes additional spaces for relaxation and entertaining with a loft, wet bar, and third guest suite. The loft leads out to a special design feature of the home called the “sunset overlook.” This balcony just outside of the loft was designed to create a perfect place to gaze at the stars and enjoy an evening by the fireplace. View the Catalina in Cortile. 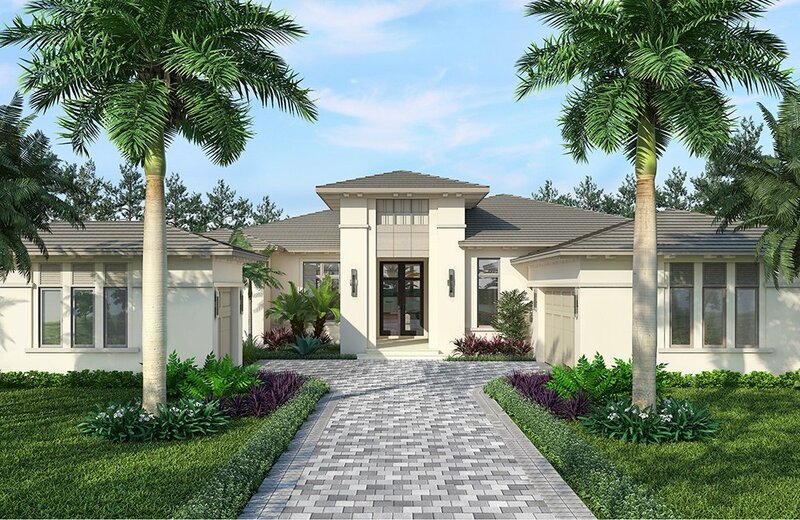 The Bianca is the newest model home from London Bay Homes in Mediterra Naples. It features three bedrooms and four bathrooms in 3,735 square feet under air. One of the highlights of this floor plan is the massive great room that opens to a covered terrace with an outdoor kitchen and dining area and a custom pool with a sun shelf and spa. Other features include an island kitchen with wine storage, a bonus room with a linear fireplace, a private study, and pocketing sliders that open to the outdoors. The master suite includes dual walk-in closets and a bath with dual vanities, a freestanding soaking tub, and a walk-in shower. The plan also includes a two-car garage and a one-car garage. View the Bianca model home. 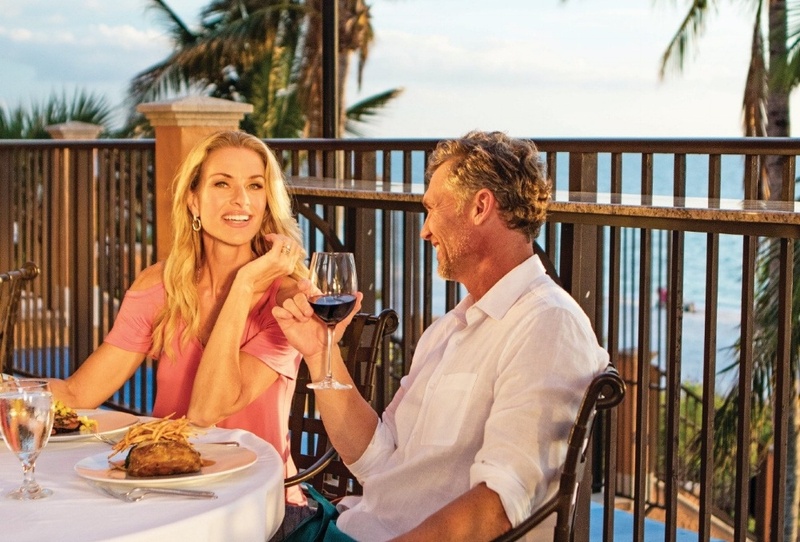 Mediterra Naples is located two miles north of Immokalee Road on Livingston Road in North Naples. Residents indulge in luxury living with a 32,000-square-foot clubhouse with fine and casual dining and a full calendar of social activities, championship golf on the two Tom Fazio-designed golf courses, a 10,000-square-foot private Beach Club on the Gulf of Mexico, a fitness center, spa, a bocce program, basketball courts, pickle ball courts, and top-rated tennis. 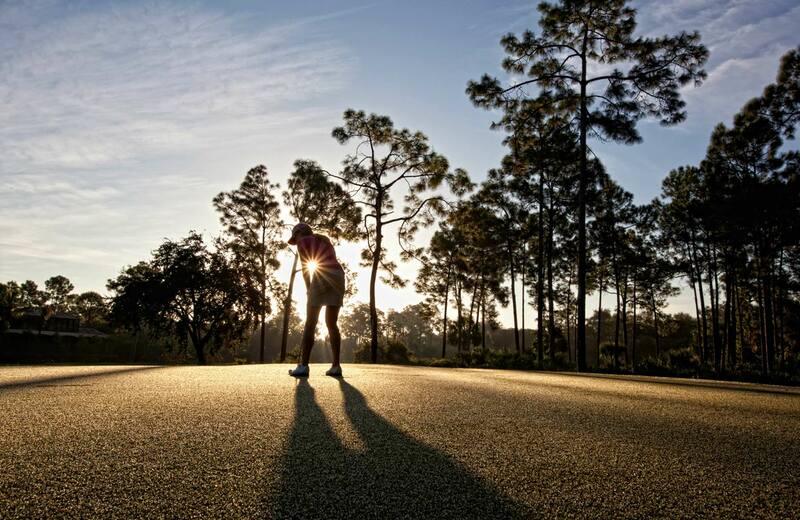 Residents can also relax in the historically themed parks and enjoy eight miles of walking and biking trails. 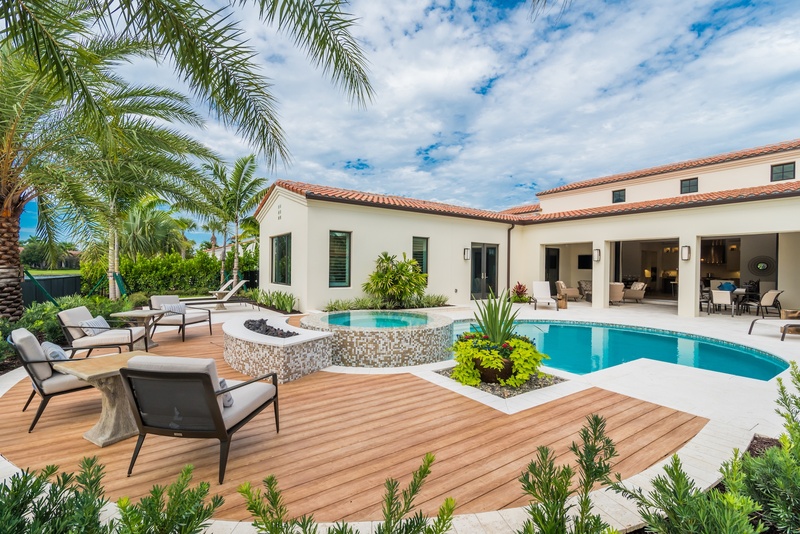 Discover your carefree lifestyle at Mediterra Naples when you visit during London Bay Homes’ 2019 Winter Model Home Showcase at Mediterra Naples.